Although many consumers today actively seek out better-for-you options, nobody wants a bland meal. Today, operators across segments are innovating with plant-forward, on-trend ingredients that can easily be used across the menu to offer dishes that both appeal to health-conscious diners but offer the craveability all consumers clamor for. Beans are a valuable tool of on-trend, economical cooking. As a low-cost, plant-based protein source that works well across all dayparts, dishes with beans are resonating with operators and diners alike. Here’s how. With consumer demand for ethnic options at an all-time high, the time is ripe for operators to innovate with these items—and beans are a natural fit for globally inspired dishes of all types. The abundance of Central and South American dishes built on beans makes these cuisines an area of opportunity, especially since they span the dayparts. Where would brunch be without huevos rancheros? And who doesn’t love a breakfast burrito, stuffed with any number of fillings such as beans, eggs, avocados and cheese? But beans aren’t only found with Latin-inspired menu items. According to Technomic’s MenuMonitor, Indian is a growing flavor paired with beans, up 9% in menu mentions year over year. The building blocks of Indian flavors, such as curry powder and garam masala, are natural kicks to the versatility of chickpeas and navy beans. Chana masala, for instance, is a blend of chickpeas, onions, cumin, coriander, ginger, garlic and tomatoes. Providing a swell of flavor with global appeal, this bean-centered dish is inexpensive to prepare and is reminiscent of the familiar American chili—but with an Indian twist. Beans for breakfast is nothing new to our English eaters—the U.K. staple dish of beans on toast goes back nearly 100 years. Hearty and economical, beans offer a big flavor for customers looking for a flavorful, filling breakfast. In the United States, though, beans are still emerging on breakfast menus. But with grain bowls topped with fried eggs, roasted vegetables and other better-for-you ingredients on the rise, it’s only a matter of time before beans are just as popular here as they are across the pond. In fact, breakfast starch dishes including beans have increased 7% year-over-year, according to Technomic’s MenuMonitor. Beans aren’t just for breakfast, either. Their protein-packed profile makes for comforting, filling lunch and dinner dishes, and because they’re perfect alongside vegetables as well as meats, they’re perfect for those following special diets as well as those who eat a more traditional array of foods. Beans’ versatility comes into play in these later dayparts as well, especially with barbecue-inspired dishes. Smoky flavors are a natural with cooked bean dishes—think shredded chicken, roast pork, or grilled skirt steak, which is up approximately 8% as a protein paired with beans, according to Technomic’s MenuMonitor. 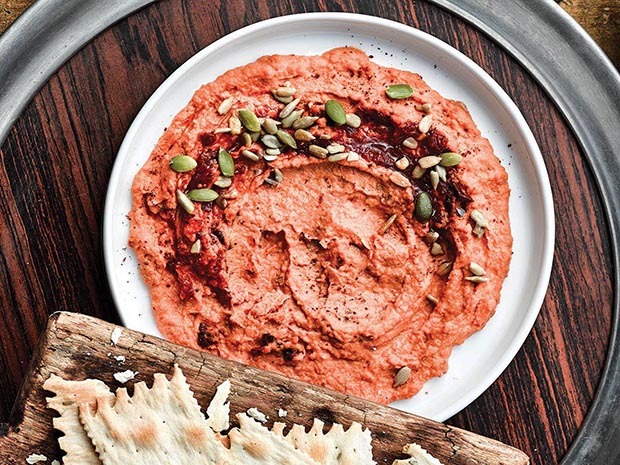 Hummus, made with chickpeas, olive oil and tahini, is the perfect dip for veggies, crackers and more—and it provides a protein punch for snackers who need something a little more satisfying. Along the same lines, operators can pique customer interest with a white-bean puree with roasted garlic, fresh basil and parmesan cheese for an Italian-inspired spread. But beyond bean dips, there are a number of other bean snacks proliferating on the menu right now. For instance, instead of roasted nuts, snackers can now turn to a selection of flavored roasted chickpeas—from sweet (cinnamon) to savory (sea salt or ranch) to spicy (habanero or barbecue) and even chocolate-covered. Beans are also showing up as chips (like black bean tortilla chips) and crackers—which can then be dipped into virtually anything, from salsa to guacamole to onion dip. Beans are a big help for the bottom line while helping to boost topline sales. Why? Gentle on food cost and requiring little energy to coax big results, cooked beans are a labor saver. And customers are all over bean dishes, from morning to night and even in between. Beans can easily fit into virtually any daypart, from savory breakfast options to snacking opportunities and even dessert. Stay on-trend by offering the latest iterations of beans and bring interest to the menu with an array of different flavors.